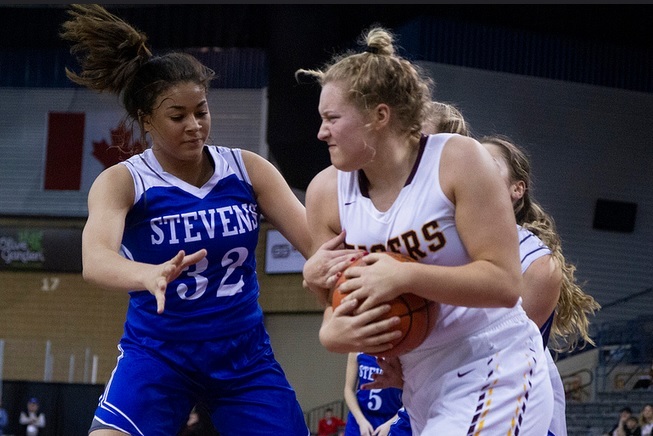 Kyah Watson, in action during this year's state tournament, was selected to the South Dakota Basketball Coaches all state team. UNDATED - The South Dakota Basketball Coaches Association released its annual Class AA Girls Basketball All State Team this week. Leading the roster is Harrisburg's Jeniah Ugofsky, who also was selected as Player of the Year. Ugofsky led the Tigers averaging 11.5 points per game, nearly 10 rebounds and 24 total blocks. Joining Ugofsky on the first team were Junior Emma Ronsiek of Sioux Fals O'Gorman, Senior Michaela Jewett of Brookings, Junior Morgan Hansen of Sioux Falls Lincoln, Senior Trinity Law of Brandon Valley and Junior Kyah Watson of Rapid City Stevens. Watson wrapped up a stellar season for the Raiders averaging 14.5 points per game and 5.8 rebounds.